A few weeks ago Disney decided to pull the plug on its gaming division and with this news came the heart-breaking cancellation of the popular sandbox title Disney Infinity. What makes this news even sadder is that today images have surfaced of an unreleased figure based on Benedict Cumberbatch’s Doctor Strange which will now never see the light of day. 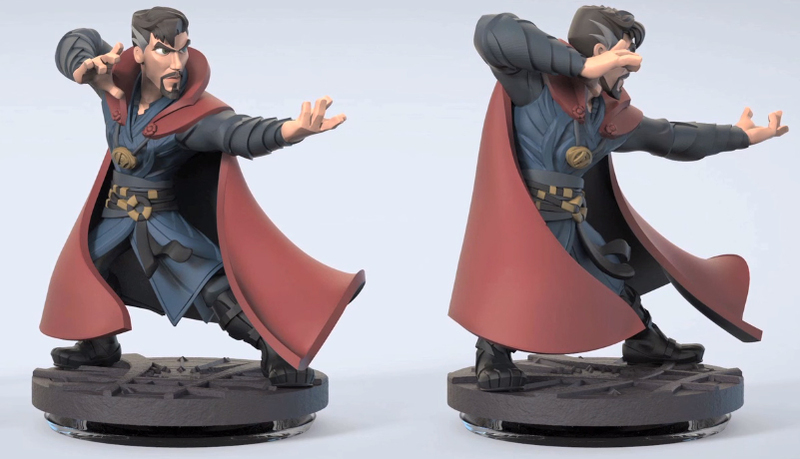 The Doctor Strange figure would have been introduced as part of Disney Infinity 3.0 – a new update to the gaming landscape accompanied by a new wave of toys which would have welcomed the former neurosurgeon turned Master of the Mystic Arts from the cult Marvel Comics series and upcoming movie. The leaked figure design is one of the coolest and most impressive we’ve seen and looks just like Cumberbatch – albeit it a more Disney-fied version of himself, which is in uniform with the rest of the characters in the Infinity universe. He appears in his wizarding robe as he will appear in the film, and is poised in a conjuring pose on a base featuring ancient symbols. We think you’ll agree that it’s so disappointing that this figure won’t hit the shelves and in addition to Doctor Strange, planned Disney Infinity figures of Peter Pan, Jafar and a new version of The Incredible Hulk are also featured in the video which comes courtesy of Infinteer Adventures channel on YouTube.